Buy Jason ® Heathy Mouth ® Mouthwash Cinnamon & Clove 473ml in the UK from our online shop or directly from our independent Scottish store. Natural mouthwash for fresh breath and tartar control. With tea tree oil and perilla seed extract. Freshen your breath and keep your mouth healthy, without harsh abrasives or irritating chemicals. Healthy Mouth® mouthwash controls tartar in two ways: Grapefruit Seed and Perilla Seed Extracts help reduce tartar build-up and tea tree Oil helps defend the oral cavity against sugar acids and acid forming bacteria that could lead to periodontal problems. Aloe Vera Gel soothes gum irritation and a blend of Clove and Cinnamon Oils keeps your breath fresh and clean. For a healthy smile and fresh breath, use JASON® Healthy Mouth® toothpaste and mouthwash twice a day. As official Jason stockist, we sell genuine Mouthwashes & Floss directly from our shop in Scotland and online throughout the UK. Where can you buy real Heathy Mouth ® Mouthwash safely online? If you are wondering where you can buy Jason ® Heathy Mouth ® Mouthwash Cinnamon & Clove 473ml safely online in the UK, then shop with us. We are an actual health foods shop; with real people selling real foods and products. Our award-winning independent shop is located in Stirling, Scotland since 1976. You can buy our Natural care products and other genuine Mouthwashes & Floss in store or safely place an order with us online or over the phone. 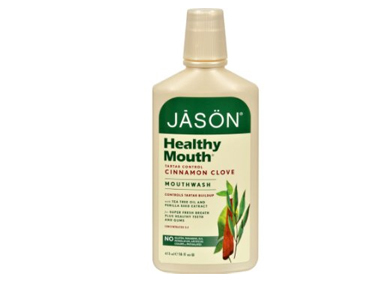 Heathy Mouth ® Mouthwash - Jason ® Heathy Mouth ® Mouthwash Cinnamon & Clove 473ml in Mouthwashes & Floss and Dental Care.